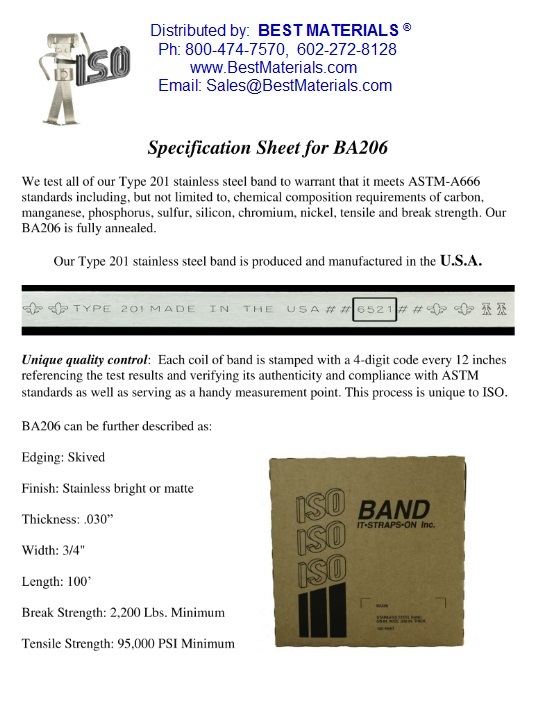 ISO Band #BA206 3/4" x 100' x 0.030", Roll of 201 Stainless Steel Banding / Strapping. 2200 lbs Break Strength. ASTM-A666 Certified. Made in USA. Price/Roll. High quality stainless steel banding for use with all types of applications including construction, marine, telecommunications, oil, gas, traffic poles, signs, industrial, vehicular and shipping. Our banding is compatible with with popular banding tools and buckles. Long lasting, strong, and adjustable. Stainless steel banding products are used where traditional fastening products such as bolts and screws could endanger the physical integrity of the attachment substrate. Changing weather and constant exposure can weaken many materials, but stainless steel banding withstands these challenges and continues to perform year after year. Thicknesses: 0.022, 0.025, 0.030, 0.044"
3/4 inch 304 Stainless Steel Ear-Lokt Style Banding Buckles. 100/Box. Price/Box. 3/4 inch x 100 ft. x 0.030 inch (0.76mm) Roll of 304 Stainless Steel Banding / Strapping. Tensile Strength: 2374 lbs. 100 Foot Roll. Price/Roll. 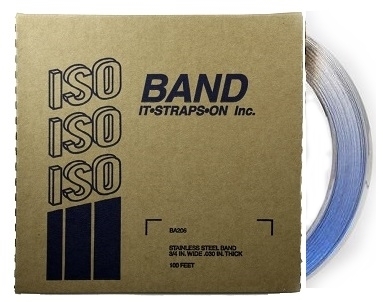 3/4 inch x 100 ft. x 0.030 inch (0.76mm) thick Roll of 304 Stainless Steel Banding / Strapping, in Blue Plastic Dispenser. Tensile Strength: 2374 lbs. 100 Foot Roll. Price/Roll. Easy Banding / Strapping / Tensioning Tool, Nickel Plated Forged Steel, #FERGT19008U000. Suitable for stainless steel banding up to 3/4 inch wide and 0.315 (0.8mm) thickness and when banding in tight space areas. Price/Each.